The Dufferin Agricultural Society Inc hosts one of the oldest running fairs in Manitoba, the Carman Country Fair. The fair was established in 1879 and is an affiliate of the Canadian Association of Fairs and Exhibitions. The Canadian Association of Fairs and Exhibitions believe fairs “hold deep cultural, traditional and emotional connections to the people of their local area and define a sense of community that grows social capital and quality of life.” In Carman we find this statement to be true as the fair would not be a success without the support of generous sponsors and the many volunteers. The weekend of the fair also brings together new and old friends to celebrate our community and individual talents our community members encompass. The 3 day event is held annually on the second weekend in July. 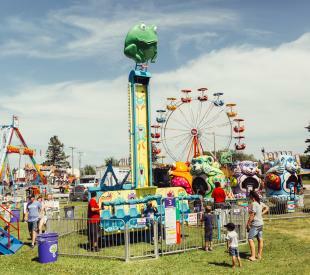 Events of the fair include 4-H and livestock shows, craft, flower and baking competitions, trade show venues, motor sports shows and a midway along with incredible entertainment throughout the weekend.